For the Norwegian frigate, see HNoMS Thor Heyerdahl. For the cruiseferry formerly named MS Thor Heyerdahl, see MS Vana Tallinn. For the ship built in 1930, see Thor Heyerdahl (ship). 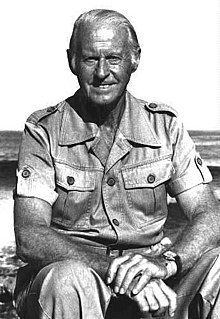 Thor Heyerdahl (Norwegian pronunciation: [tuːr ˈhæɪəɖɑːl]; October 6, 1914 – April 18, 2002) was a Norwegian adventurer and ethnographer with a background in zoology, botany, and geography. He became notable for his Kon-Tiki expedition in 1947, in which he sailed 8,000 km (5,000 mi) across the Pacific Ocean in a hand-built raft from South America to the Tuamotu Islands. The expedition was designed to demonstrate that ancient people could have made long sea voyages, creating contacts between separate cultures. This was linked to a diffusionist model of cultural development. Heyerdahl subsequently made other voyages designed to demonstrate the possibility of contact between widely separated ancient people, notably the Ra II expedition of 1970, when he sailed from the west coast of Africa to Barbados in a papyrus reed boat. He was appointed a government scholar in 1984. In May 2011, the Thor Heyerdahl Archives were added to UNESCO's "Memory of the World" Register. At the time, this list included 238 collections from all over the world. The Heyerdahl Archives span the years 1937 to 2002 and include his photographic collection, diaries, private letters, expedition plans, articles, newspaper clippings, original book, and article manuscripts. The Heyerdahl Archives are administered by the Kon-Tiki Museum and the National Library of Norway in Oslo. Heyerdahl was born in Larvik, Norway, the son of master brewer Thor Heyerdahl (1869–1957) and his wife, Alison Lyng (1873–1965). As a young child, Heyerdahl showed a strong interest in zoology, inspired by his mother who had a strong interest in Charles Darwin's theory of evolution. He created a small museum in his childhood home, with a common adder (Vipera berus) as the main attraction. He studied zoology and geography at the faculty of biological science at the University of Oslo. At the same time, he privately studied Polynesian culture and history, consulting what was then the world's largest private collection of books and papers on Polynesia, owned by Bjarne Kroepelien, a wealthy wine merchant in Oslo. (This collection was later purchased by the University of Oslo Library from Kroepelien's heirs and was attached to the Kon-Tiki Museum research department.) After seven terms and consultations with experts in Berlin, a project was developed and sponsored by Heyerdahl's zoology professors, Kristine Bonnevie and Hjalmar Broch. He was to visit some isolated Pacific island groups and study how the local animals had found their way there. Just before sailing together to the Marquesas Islands in 1936, Heyerdahl married his first wife, Liv Coucheron-Torp (1916–1969[dubious – discuss]), whom he had met shortly before enrolling at the university, and who had studied economics there. The couple had two sons: Thor Jr and Bjørn. The marriage ended in divorce. After the Occupation of Norway by Nazi Germany, he served with the Free Norwegian Forces from 1944, in the far north province of Finnmark. In 1949, Heyerdahl married Yvonne Dedekam-Simonsen (1924–2006). They had three daughters: Annette, Marian and Helene Elisabeth. They were divorced in 1969. Heyerdahl blamed their separation on his being away from home and differences in their ideas for bringing up children. In his autobiography, he concluded that he should take the entire blame for their separation. In 1991, Heyerdahl married Jacqueline Beer (born 1932) as his third wife. They lived in Tenerife, Canary Islands and were very actively involved with archaeological projects, especially in Túcume, Peru, and Azov until his death in 2002. He still had been hoping to undertake an archaeological project in Samoa before he died. Heyerdahl died on April 18, 2002, in Colla Micheri, Liguria, Italy, where he had gone to spend the Easter holidays with some of his closest family members. The Norwegian government gave him a state funeral in Oslo Cathedral on April 26, 2002. 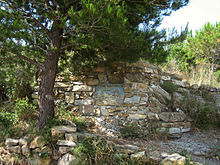 He is buried in the garden of the family home in Colla Micheri. He was an atheist. The events surrounding his stay on the Marquesas, most of the time on Fatu Hiva, were told first in his book På Jakt etter Paradiset (Hunt for Paradise) (1938), which was published in Norway but, following the outbreak of World War II, never translated and largely forgotten. Many years later, having achieved notability with other adventures and books on other subjects, Heyerdahl published a new account of this voyage under the title Fatu Hiva (London: Allen & Unwin, 1974). The story of his time on Fatu Hiva and his side trip to Hivaoa and Mohotani is also related in Green Was the Earth on the Seventh Day (Random House, 1996). In 1947, Heyerdahl and five fellow adventurers sailed from Peru to the Tuamotu Islands, French Polynesia in a pae-pae raft that they had constructed from balsa wood and other native materials, christened the Kon-Tiki. The Kon-Tiki expedition was inspired by old reports and drawings made by the Spanish Conquistadors of Inca rafts, and by native legends and archaeological evidence suggesting contact between South America and Polynesia. The Kon-Tiki smashed into the reef at Raroia in the Tuamotus on August 7, 1947, after a 101-day, 4,300-nautical-mile (5,000-mile or 8,000 km) journey across the Pacific Ocean. Heyerdahl had nearly drowned at least twice in childhood and did not take easily to water; he said later that there were times in each of his raft voyages when he feared for his life. Kon-Tiki demonstrated that it was possible for a primitive raft to sail the Pacific with relative ease and safety, especially to the west (with the trade winds). The raft proved to be highly manoeuvrable, and fish congregated between the nine balsa logs in such numbers that ancient sailors could have possibly relied on fish for hydration in the absence of other sources of fresh water. Other rafts have repeated the voyage, inspired by Kon-Tiki. Heyerdahl's book about The Kon-Tiki Expedition: By Raft Across the South Seas has been translated into 70 languages. The documentary film of the expedition entitled Kon-Tiki won an Academy Award in 1951. A dramatised version was released in 2012, also called Kon-Tiki, and was nominated for both the Best Foreign Language Oscar at the 85th Academy Awards and a Golden Globe Award for Best Foreign Language Film at the 70th Golden Globe Awards. It was the first time that a Norwegian film was nominated for both an Oscar and a Golden Globe. Anthropologists continue to believe that Polynesia was settled from west to east, based on linguistic, physical, and genetic evidence, migration having begun from the Asian mainland. There are controversial indications, though, of some sort of South American/Polynesian contact, most notably in the fact that the South American sweet potato is served as a dietary staple throughout much of Polynesia. Blood samples taken in 1971 and 2008 from Easter Islanders without any European or other external descent were analysed in a 2011 study, which concluded that the evidence supported some aspects of Heyerdahl's hypothesis. This result has been questioned because of the possibility of contamination by South Americans after European contact with the islands. However, more recent DNA work (after Heyerdahl's death) contradicts the post-European-contact contamination hypothesis, finding the South American DNA sequences to be far older than that. Heyerdahl had attempted to counter the linguistic argument with the analogy that he would prefer to believe that African-Americans came from Africa, judging from their skin colour, and not from England, judging from their speech. Heyerdahl claimed that in Incan legend there was a sun-god named Con-Tici Viracocha who was the supreme head of the mythical fair-skinned people in Peru. The original name for Viracocha was Kon-Tiki or Illa-Tiki, which means Sun-Tiki or Fire-Tiki. Kon-Tiki was high priest and sun-king of these legendary "white men" who left enormous ruins on the shores of Lake Titicaca. The legend continues with the mysterious bearded white men being attacked by a chief named Cari, who came from the Coquimbo Valley. They had a battle on an island in Lake Titicaca, and the fair race was massacred. However, Kon-Tiki and his closest companions managed to escape and later arrived on the Pacific coast. The legend ends with Kon-Tiki and his companions disappearing westward out to sea. When the Spaniards came to Peru, Heyerdahl asserted, the Incas told them that the colossal monuments that stood deserted about the landscape were erected by a race of white gods who had lived there before the Incas themselves became rulers. The Incas described these "white gods" as wise, peaceful instructors who had originally come from the north in the "morning of time" and taught the Incas' primitive forebears architecture as well as manners and customs. They were unlike other Native Americans in that they had "white skins and long beards" and were taller than the Incas. The Incas said that the "white gods" had then left as suddenly as they had come and fled westward across the Pacific. After they had left, the Incas themselves took over power in the country. Heyerdahl said that when the Europeans first came to the Pacific islands, they were astonished that they found some of the natives to have relatively light skins and beards. There were whole families that had pale skin, hair varying in color from reddish to blonde. In contrast, most of the Polynesians had golden-brown skin, raven-black hair, and rather flat noses. Heyerdahl claimed that when Jakob Roggeveen first discovered Easter Island in 1722, he supposedly noticed that many of the natives were white-skinned. Heyerdahl claimed that these people could count their ancestors who were "white-skinned" right back to the time of Tiki and Hotu Matua, when they first came sailing across the sea "from a mountainous land in the east which was scorched by the sun". The ethnographic evidence for these claims is outlined in Heyerdahl's book Aku-Aku: The Secret of Easter Island. Heyerdahl proposed that Tiki's neolithic people colonized the then uninhabited Polynesian islands as far north as Hawaii, as far south as New Zealand, as far east as Easter Island, and as far west as Samoa and Tonga around 500 AD. They supposedly sailed from Peru to the Polynesian islands on pae-paes—large rafts built from balsa logs, complete with sails and each with a small cottage. They built enormous stone statues carved in the image of human beings on Pitcairn, the Marquesas, and Easter Island that resembled those in Peru. They also built huge pyramids on Tahiti and Samoa with steps like those in Peru. But all over Polynesia, Heyerdahl found indications that Tiki's peaceable race had not been able to hold the islands alone for long. He found evidence that suggested that seagoing war canoes as large as Viking ships and lashed together two and two had brought Stone Age Northwest American Indians to Polynesia around 1100 AD, and they mingled with Tiki's people. The oral history of the people of Easter Island, at least as it was documented by Heyerdahl, is completely consistent with this theory, as is the archaeological record he examined (Heyerdahl 1958). In particular, Heyerdahl obtained a radiocarbon date of 400 AD for a charcoal fire located in the pit that was held by the people of Easter Island to have been used as an "oven" by the "Long Ears", which Heyerdahl's Rapa Nui sources, reciting oral tradition, identified as a white race that had ruled the island in the past (Heyerdahl 1958). Heyerdahl further argued in his book American Indians in the Pacific that the current inhabitants of Polynesia migrated from an Asian source, but via an alternate route. He proposes that Polynesians travelled with the wind along the North Pacific current. These migrants then arrived in British Columbia. Heyerdahl called contemporary tribes of British Columbia, such as the Tlingit and Haida, descendants of these migrants. Heyerdahl claimed that cultural and physical similarities existed between these British Columbian tribes, Polynesians, and the Old World source. Heyerdahl's theory of Polynesian origins has not gained acceptance among anthropologists. Physical and cultural evidence had long suggested that Polynesia was settled from west to east, migration having begun from the Asian mainland, not South America. In the late 1990s, genetic testing found that the mitochondrial DNA of the Polynesians is more similar to people from Southeast Asia than to people from South America, showing that their ancestors most likely came from Asia. Anthropologist Robert Carl Suggs included a chapter titled "The Kon-Tiki Myth" in his 1960 book on Polynesia, concluding that "The Kon-Tiki theory is about as plausible as the tales of Atlantis, Mu, and 'Children of the Sun.' Like most such theories, it makes exciting light reading, but as an example of scientific method it fares quite poorly." Anthropologist and National Geographic Explorer-in-Residence Wade Davis also criticised Heyerdahl's theory in his 2009 book The Wayfinders, which explores the history of Polynesia. Davis says that Heyerdahl "ignored the overwhelming body of linguistic, ethnographic, and ethnobotanical evidence, augmented today by genetic and archaeological data, indicating that he was patently wrong." A 2009 study by Norwegian researcher Erik Thorsby suggested that there was some merit to Heyerdahl's ideas and that, while Polynesia was colonized from Asia, some contact with South America also existed. Some critics suggest, however, that Thorsby's research is inconclusive because his data may have been influenced by recent population contact. However, more recent work[when?] indicates that the South American component of Easter Island people's genomes predates European contact: a team including Anna-Sapfo Malaspinas (from the Natural History Museum of Denmark) analysed the genomes of 27 native Rapanui people and found that their DNA was on average 76 per cent Polynesian, 8 per cent Native American and 16 per cent European. Analysis showed that: "although the European lineage could be explained by contact with white Europeans after the island was "discovered" in 1722 by Dutch sailors, the South American component was much older, dating to between about 1280 and 1495, soon after the island was first colonised by Polynesians in around 1200." Together with ancient skulls found in Brazil – with solely Polynesian DNA – this does suggest some pre-European-contact travel to and from South America from Polynesia. In 1955–1956, Heyerdahl organized the Norwegian Archaeological Expedition to Rapa Nui (Easter Island). The expedition's scientific staff included Arne Skjølsvold, Carlyle Smith, Edwin Ferdon, Gonzalo Figueroa and William Mulloy. Heyerdahl and the professional archaeologists who travelled with him spent several months on Rapa Nui investigating several important archaeological sites. Highlights of the project include experiments in the carving, transport and erection of the notable moai, as well as excavations at such prominent sites as Orongo and Poike. The expedition published two large volumes of scientific reports (Reports of the Norwegian Archaeological Expedition to Easter Island and the East Pacific) and Heyerdahl later added a third (The Art of Easter Island). Heyerdahl's popular book on the subject, Aku-Aku was another international best-seller. In Easter Island: The Mystery Solved (Random House, 1989), Heyerdahl offered a more detailed theory of the island's history. Based on native testimony and archaeological research, he claimed the island was originally colonized by Hanau eepe ("Long Ears"), from South America, and that Polynesian Hanau momoko ("Short Ears") arrived only in the mid-16th century; they may have come independently or perhaps were imported as workers. According to Heyerdahl, something happened between Admiral Roggeveen's discovery of the island in 1722 and James Cook's visit in 1774; while Roggeveen encountered white, Indian, and Polynesian people living in relative harmony and prosperity, Cook encountered a much smaller population consisting mainly of Polynesians and living in privation. Heyerdahl notes the oral tradition of an uprising of "Short Ears" against the ruling "Long Ears". The "Long Ears" dug a defensive moat on the eastern end of the island and filled it with kindling. During the uprising, Heyerdahl claimed, the "Long Ears" ignited their moat and retreated behind it, but the "Short Ears" found a way around it, came up from behind, and pushed all but two of the "Long Ears" into the fire. This moat was found by the Norwegian expedition and it was partly cut down into the rock. Layers of fire were revealed but no fragments of bodies. As for the origin of the people of Easter Island, DNA tests have shown a connection to South America, critics conjecture that this was a result of recent events, but whether this is inherited from a person coming in later times is hard to know. If the story that (almost) all Long Ears were killed in a civil war is true, as the islanders story goes, it would be expected that the statue-building South American bloodline would have been nearly utterly destroyed, leaving for the most part the invading Polynesian bloodline. In 1969 and 1970, Heyerdahl built two boats from papyrus and attempted to cross the Atlantic Ocean from Morocco in Africa. Based on drawings and models from ancient Egypt, the first boat, named Ra (after the Egyptian Sun god), was constructed by boat builders from Lake Chad using papyrus reed obtained from Lake Tana in Ethiopia and launched into the Atlantic Ocean from the coast of Morocco. The Ra crew included Thor Heyerdahl (Norway), Norman Baker (USA), Carlo Mauri (Italy), Yuri Senkevich (USSR), Santiago Genovés (Mexico), Georges Sourial (Egypt) and Abdullah Djibrine (Chad). Only Heyerdahl and Baker had sailing and navigation experience. After a number of weeks, Ra took on water. The crew discovered that a key element of the Egyptian boatbuilding method had been neglected, a tether that acted like a spring to keep the stern high in the water while allowing for flexibility. Water and storms eventually caused it to sag and break apart after sailing more than 6400 km (4000 miles). The crew was forced to abandon Ra, some hundred miles (160 km) before the Caribbean islands, and was saved by a yacht. The following year, 1970, a similar vessel, Ra II, was built of papyrus by Demetrio, Juan and José Limachi from Lake Titicaca in Bolivia and likewise set sail across the Atlantic from Morocco, this time with great success. The crew was mostly the same; though Djibrine had been replaced by Kei Ohara from Japan and Madani Ait Ouhanni from Morocco. The boat became lost and was the subject of a United Nations search and rescue mission. The search included international assistance including people as far afield as Loo-Chi Hu of New Zealand. The boat reached Barbados, thus demonstrating that mariners could have dealt with trans-Atlantic voyages by sailing with the Canary Current. The Ra II is now in the Kon-Tiki Museum in Oslo, Norway. The book The Ra Expeditions and the film documentary Ra (1972) were made about the voyages. Apart from the primary aspects of the expedition, Heyerdahl deliberately selected a crew representing a great diversity in race, nationality, religion and political viewpoint in order to demonstrate that at least on their own little floating island, people could cooperate and live peacefully. Additionally, the expedition took samples of marine pollution and presented their report to the United Nations. Model of the Tigris at the Pyramids of Güímar, Tenerife. Today we burn our proud ship ... to protest against inhuman elements in the world of 1978 ... Now we are forced to stop at the entrance to the Red Sea. Surrounded by military airplanes and warships from the world's most civilized and developed nations, we have been denied permission by friendly governments, for reasons of security, to land anywhere, but in the tiny, and still neutral, Republic of Djibouti. Elsewhere around us, brothers and neighbors are engaged in homicide with means made available to them by those who lead humanity on our joint road into the third millennium. To the innocent masses in all industrialized countries, we direct our appeal. We must wake up to the insane reality of our time ... We are all irresponsible, unless we demand from the responsible decision makers that modern armaments must no longer be made available to people whose former battle axes and swords our ancestors condemned. Our planet is bigger than the reed bundles that have carried us across the seas, and yet small enough to run the same risks unless those of us still alive open our eyes and minds to the desperate need of intelligent collaboration to save ourselves and our common civilization from what we are about to convert into a sinking ship. In the years that followed, Heyerdahl was often outspoken on issues of international peace and the environment. The Tigris had an eleven-man crew: Thor Heyerdahl (Norway), Norman Baker (USA), Carlo Mauri (Italy), Yuri Senkevich (USSR), Germán Carrasco (Mexico), Hans Petter Bohn (Norway), Rashad Nazar Salim (Iraq), Norris Brock (USA), Toru Suzuki (Japan), Detlef Soitzek (Germany), and Asbjørn Damhus (Denmark). Heyerdahl made four visits to Azerbaijan in 1981, 1994, 1999 and 2000. Heyerdahl had long been fascinated with the rock carvings that date back to about 8th-7th millennia BCE at Gobustan (about 30 miles/48 km west of Baku). He was convinced that their artistic style closely resembled the carvings found in his native Norway. 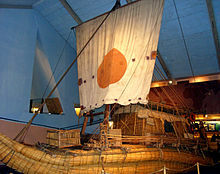 The ship designs, in particular, were regarded by Heyerdahl as similar and drawn with a simple sickle-shaped line, representing the base of the boat, with vertical lines on deck, illustrating crew or, perhaps, raised oars. Based on this and other published documentation, Heyerdahl proposed that Azerbaijan was the site of an ancient advanced civilization. He believed that natives migrated north through waterways to present-day Scandinavia using ingeniously constructed vessels made of skins that could be folded like cloth. When voyagers travelled upstream, they conveniently folded their skin boats and transported them on pack animals. On Heyerdahl's visit to Baku in 1999, he lectured at the Academy of Sciences about the history of ancient Nordic Kings. He spoke of a notation made by Snorri Sturluson, a 13th-century historian-mythographer in Ynglinga Saga, which relates that "Odin (a Scandinavian god who was one of the kings) came to the North with his people from a country called Aser." (see also House of Ynglings and Mythological kings of Sweden). Heyerdahl accepted Snorri's story as literal truth, and believed that a chieftain led his people in a migration from the east, westward and northward through Saxony, to Fyn in Denmark, and eventually settling in Sweden. Heyerdahl claimed that the geographic location of the mythic Aser or Æsir matched the region of contemporary Azerbaijan – "east of the Caucasus mountains and the Black Sea". "We are no longer talking about mythology," Heyerdahl said, "but of the realities of geography and history. Azerbaijanis should be proud of their ancient culture. It is just as rich and ancient as that of China and Mesopotamia." In September 2000, Heyerdahl returned to Baku for the fourth time and visited the archaeological dig in the area of the Church of Kish. One of the last projects of his life, Jakten på Odin, 'The Search for Odin', was a sudden revision of his Odin hypothesis, in furtherance of which he initiated 2001–2002 excavations in Azov, Russia, near the Sea of Azov at the northeast of the Black Sea. He searched for the remains of a civilization to match the account of Odin in Snorri Sturlusson, quite a bit north of his original target of Azerbaijan on the Caspian Sea only two years earlier. This project generated harsh criticism and accusations of pseudoscience from historians, archaeologists and linguists in Norway, who accused Heyerdahl of selective use of sources, and a basic lack of scientific methodology in his work. As of 2017[update], Heyerdahl's Odin hypothesis has yet to be validated by any historian, archaeologist or linguist. Heyerdahl also investigated the mounds found on the Maldive Islands in the Indian Ocean. There, he found sun-oriented foundations and courtyards, as well as statues with elongated earlobes. Heyerdahl believed that these finds fit with his theory of a seafaring civilization which originated in what is now Sri Lanka, colonized the Maldives, and influenced or founded the cultures of ancient South America and Easter Island. His discoveries are detailed in his book The Maldive Mystery. In 1991, he studied the Pyramids of Güímar on Tenerife and declared that they were not random stone heaps but pyramids. Based on the discovery made by the astrophysicists Aparicio, Belmonte and Esteban, from the Instituto de Astrofísica de Canarias that the "pyramids" were astronomically oriented and being convinced that they were of ancient origin, he claimed that the ancient people who built them were most likely sun worshippers. Heyerdahl advanced a theory according to which the Canaries had been bases of ancient shipping between America and the Mediterranean. Heyerdahl was also an active figure in Green politics. He was the recipient of numerous medals and awards. He also received 11 honorary doctorates from universities in the Americas and Europe. In subsequent years, Heyerdahl was involved with many other expeditions and archaeological projects. He remained best known for his boat-building, and for his emphasis on cultural diffusionism. He died, aged 87, from a brain tumour. After receiving the diagnosis he prepared for dying by refusing to eat or take medication. The Norwegian government granted Heyerdahl the honour of a state funeral in the Oslo Cathedral on April 26, 2002. His cremated remains lie in the garden of his family's home in Colla Micheri. Although much of his work remains unaccepted within the scientific community, Heyerdahl increased public interest in ancient history and anthropology. He also showed that long-distance ocean voyages were possible with ancient designs. As such, he was a major practitioner of experimental archaeology. In 1954 William Willis sailed alone from Peru to American Samoa on the small raft Seven Little Sisters. Kantuta Expeditions, repeated expeditions of Kon-Tiki by Eduard Ingris. In 1982, Thor Heyerdahl is mentioned as possibly joining an expedition across an ocean to be conducted by one of the characters in Newhart. Heyerdahl's grandson, Olav Heyerdahl, retraced his grandfather's Kon-Tiki voyage in 2006 as part of a six-member crew. The voyage, organized by Torgeir Higraff and called the Tangaroa Expedition, was intended as a tribute to Heyerdahl, an effort to better understand navigation via centerboards ("guara") as well as a means to monitor the Pacific Ocean's environment. A book about the Tangaroa Expedition by Torgeir Higraff was published in 2007. The book has numerous photos from the Kon-Tiki voyage 60 years earlier and is illustrated with photographs by Tangaroa crew member Anders Berg (Oslo: Bazar Forlag, 2007). "Tangaroa Expedition" has also been produced as a documentary DVD in English, Norwegian, Swedish and Spanish. The Thor Heyerdahl Institute was established in 2000. Heyerdahl himself agreed to the founding of the institute and it aims to promote and continue to develop Heyerdahl's ideas and principles. The institute is located in Heyerdahl's birth town in Larvik, Norway. The Kon-Tiki Museum on the Bygdøy peninsula in Oslo, Norway houses vessels and maps from the Kon-Tiki expedition, as well as a library with about 8000 books. In Larvik, the birthplace of Heyerdahl, the municipality began a project in 2007 to attract more visitors. Since then, they have purchased and renovated Heyerdahl's childhood home, arranged a yearly raft regatta in his honour at the end of summer and begun to develop a Heyerdahl centre. Paul Theroux, in his book The Happy Isles of Oceania, criticizes Heyerdahl for trying to link the culture of Polynesian islands with the Peruvian culture. However, recent scientific investigation that compares the DNA of some of the Polynesian islands with natives from Peru suggests that there is some merit to Heyerdahl's ideas and that while Polynesia was colonized from Asia, some contact with South America also existed. Dubai College, an independent British school in Dubai, named one of the school's houses Heyerdahl. Other school house names for Dubai College include Barbarossa, Chichester and Cousteau, all surnames of famous explorers. Google honoured Heyerdahl on his 100th birthday by making a Google Doodle. 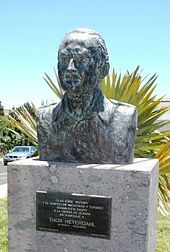 Bust of Thor Heyerdahl. Güímar, Tenerife. Asteroid 2473 Heyerdahl is named after him, as are HNoMS Thor Heyerdahl, a Norwegian Nansen class frigate, along with MS Thor Heyerdahl (now renamed MS Vana Tallinn) and Thor Heyerdahl, a German three-masted sail training vessel originally owned by a participant of the Tigris expedition. Thor Heyerdahl Upper Secondary School in Larvik, the town of his birth, is also named after him. På Jakt efter Paradiset (Hunt for Paradise), 1938; Fatu-Hiva: Back to Nature (changed title in English in 1974). The Kon-Tiki Expedition: By Raft Across the South Seas (Kon-Tiki ekspedisjonen, also known as Kon-Tiki: Across the Pacific in a Raft), 1948. American Indians in the Pacific: The Theory Behind the Kon-Tiki Expedition (Chicago: Rand McNally, 1952), 821 pages. Aku-Aku: The Secret of Easter Island, 1957. Skjebnemote vest for havet [Fate Meets West of the Ocean], 1992 (in Norwegian and German only) the Native Americans tell their story, white and bearded Gods, infrastructure was not built by the Inkas but their more advanced predecessors. ^ "New collections come to enrich the Memory of the World". Portal.unesco.org. Archived from the original on July 14, 2012. Retrieved September 1, 2011. ^ "Memory of the World Register Application form from Kon-Tiki Museum for Thor Heyerdahl Archives" (PDF). Retrieved September 1, 2011. ^ Thor Heyerdahl, In the Footsteps of Adam: A Memoir, London: Abacus Books, 2001, p. 78. ^ Thor Heyerdahl, "In the Footsteps of Adam". Christophersen translation (ISBN 0-349-11273-8), London: Abacus, 2001, p. 254. ^ J. Bjornar Storfjell, "Thor Heyerdahl's Final Projects". in Azerbaijan International, Vol. 10:2 (Summer 2002), p. 25. ^ J. Bjornar Storfjell, "Thor Heyerdahl's Final Projects," in Azerbaijan International, Vol. 10:2 (Summer 2002), p. 25. ^ "Thor Heyerdahl". Retrieved March 27, 2017. ^ "Kon-Tiki - WORLD". Retrieved March 27, 2017. ^ "Quick Facts: Comparing the Two Rafts: Kon-Tiki and Tangaroa," in Azerbaijan International, Vol. 14:4 (Winter 2006), p. 35. ^ Personal correspondence via fax on February 2, 1995, to Editor Betty Blair, Azerbaijan International magazine for article "Kon-Tiki Man", Azerbaijan International, Vol. 3:1 (Spring 1995), pp. 62-63. ^ Heyerdahl's Kon-Tiki has been translated into 71 languages, according to the Director of Kon-Tiki Museum, September 2013. Azerbaijani language being the 70th. ^ "Oscars: Hollywood announces 85th Academy Award nominations". BBC News. Retrieved January 10, 2013. ^ Nikki Finke. "lasse_hallstrom.jpg". Deadline. ^ Ryland, Julie (January 11, 2013). "Norwegian film "Kon Tiki" nominated for Oscar". The Norway Post. Retrieved January 11, 2013. ^ "Early Americans helped colonise Easter Island - life - 06 June 2011". New Scientist. Retrieved September 1, 2011. ^ Alleyne, Richard (June 17, 2011). "Kon-Tiki explorer was partly right – Polynesians had South American roots". London: Telegraph. Retrieved September 1, 2011. ^ "Påskeøya: Heyerdahl kan ha hatt litt rett" (in Norwegian). Apollon. Archived from the original on September 30, 2011. Retrieved September 1, 2011. ^ "Did Easter Islanders Mix It Up With South Americans?". sciencemag.org. ^ a b "New findings show more contact between prehistoric humans". October 23, 2014. ^ Robert C. Suggs The Island Civilizations of Polynesia, New York: New American Library, p.212-224. ^ Kirch, P. (2000). On the Roads to the Wind: An archaeological history of the Pacific Islands before European contact. Berkeley: University of California Press, 2000. ^ Barnes, S.S.; et al. (2006). "Ancient DNA of the Pacific rat (Rattus exulans) from Rapa Nui (Easter Island)" (PDF). Journal of Archaeological Science. 33 (11): 1536–1540. doi:10.1016/j.jas.2006.02.006. Archived from the original (PDF) on July 19, 2011. ^ Robert C. Suggs, The Island Civilizations of Polynesia, New York: New American Library, p.224. ^ Wade Davis, The Wayfinders: Why Ancient Wisdom Matters in the Modern World, Crawley: University of Western Australia Publishing, p.46. ^ Thorsby, E; Flåm, S. T.; Woldseth, B; Dupuy, B. M.; Sanchez-Mazas, A; Fernandez-Vina, M. A. (June 2009). "Further evidence of an Amerindian contribution to the Polynesian gene pool on Easter Island". Tissue Antigens. 73 (6): 582–5. doi:10.1111/j.1399-0039.2009.01233.x. PMID 19493235. ^ a b Thorsby, E.; Flåm, S. T.; Woldseth, B.; Dupuy, B. M.; Sanchez-Mazas, A.; Fernandez-Vina, M. A. (2009). "Further evidence of an Amerindian contribution to the Polynesian gene pool on Easter Island". Tissue Antigens. 73 (6): 582–585. doi:10.1111/j.1399-0039.2009.01233.x. PMID 19493235. ^ a b Michael Marshall (June 6, 2011). "Early Americans helped colonise Easter Island". New Scientist. Retrieved August 25, 2012. ^ Lawler, Andrew. "Did Easter Islanders Mix It Up With South Americans?" Science News, Washington, 6 February 2012. Retrieved on 7 January 2014. ^ Malcolm Coad (September 4, 2008). "Gonzalo Figueroa". London: Guardian. Retrieved September 1, 2011. ^ "KON-TIKI MUSEET : THOR HEYERDAHLS FORSKNINGSSTIFTELSE". ^ richard alleyne (2011). "Thor Heyedahl". Telegraph. ^ Heyerdahl, Thor (1972). The Ra Expeditions. p. 197. ^ Ryne, Linn. . Retrieved January 13, 2008. ^ "Heyerdahl award". Norges Rederiforbund. Retrieved November 29, 2013. ^ Heyerdahl, Betty Blair, Bjornar Storfjell, "25 Years Ago, Heyerdahl Burns Tigris Reed Ship to Protest War," in Azerbaijan International, Vol. 11:1 (Spring 2003), pp. 20-21. ^ Forecoming 2014: Thor Heyerdahl and Azerbaijan, to be published jointly by University of Oslo and Azerbaijan University of Languages, Editor Vibeke Roeggen et al. ^ "Thor Heyerdahl in Azerbaijan". Azer.com. Retrieved September 1, 2011. ^ Stenersens, J. (trans.) (1987). Snorri, The Sagas of the Viking Kings of Norway. Oslo: Forlag, 1987. ^ "8.4 The Kish Church - Digging Up History - An Interview with J. Bjornar Storfjell". ^ Storfjell, "Thor Heyerdahl's Final Projects," in Azerbaijan International, Vol. 10:2 (Summer 2002). ^ Harris M. Lentz III (April 9, 2003). Obituaries in the Performing Arts, 2002: Film, Television, Radio, Theatre, Dance, Music, Cartoons and Pop Culture. McFarland. pp. 134–. ISBN 978-0-7864-1464-2. ^ Radford, Tim (April 19, 2002). "Thor Heyerdahl dies at 87". The Guardian. London. Retrieved July 6, 2009. ^ Torgeir Saeverud Higraff with Betty Blair, "Tangaroa Pacific Voyage: Testing Heyerdahl's Theories about Kon-Tiki 60 Years Later", Azerbaijan International, Vol. 14:4 (Winter 2006), pp. 28-53. ^ Tangaroa Expedition, available only in Norwegian (ISBN 978-82-8087-199-2), 363 pages. The book has photos related to the Kon-Tiki expedition 60 years earlier and is lavishly illustrated with Tangaroa photos by Swedish crew member Anders Berg. ^ "AS Videomaker". web.archive.org. October 25, 2017. ^ (in Bokmål) Heyerdahl-byen. op.no. Retrieved on March 5, 2011. ^ "Heyerdahl Google Doodle". October 6, 2014. Retrieved October 6, 2014. ^ a b c d e f g h i j k l m n o p q r s t u v w x y z aa ab (in Bokmål) nrk.no. Retrieved on July 7, 2011. ^ "Presidenza della Republica; ONORIFICENZE" (in Italian). Retrieved March 12, 2013. ^ Armbrester, Margaret E. (1992), Armbrester, Margaret E. (1992). The Civitan Story. Birmingham, AL: Ebsco Media. p. 95. ^ "Reply to a parliamentary question" (pdf) (in German). p. 1381. Retrieved November 16, 2012. ^ "Thor Heyerdahl". Retrieved January 12, 2011. ^ "Thor Heyerdahl: Beyond Borders, Beyond Seas: Links to Azerbaijan," Western University, Book VII: Exploration Series, 2011, pp. 22-23. ^ Walter Gibbs (December 19, 2000). "Did the Vikings Stay? Vatican Files May Offer Clues". The New York Times. Retrieved February 12, 2013. Heyerdahl, Thor. Aku-Aku: The Secret of Easter Island. Rand McNally. 1958. Heyerdahl, Thor. Kon-Tiki. Rand McNally & Company. 1950. Wikimedia Commons has media related to Thor Heyerdahl. Thor Heyerdahl in Baku Azerbaijan International, Vol. 7:3 (Autumn 1999), pp. 96–97. The 'Tigris' expedition, with Heyerdahl's war protest Azerbaijan International, Vol. 11:1 (Spring 2003), pp. 20–21. Bjornar Storfjell's account: A reference to his last project Jakten på Odin Azerbaijan International, Vol. 10:2 (Summer 2002).